including shipment and the low latency USB Audio driver for Windows. Ships within max. 3 days. - Here's the schematics and and chip datasheet. 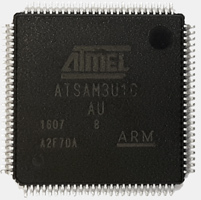 Pricing: 5x ATSAM3U1CB-AU (4x4 USB2.0 JCT2 chip) EUR 55.00 (total - EUR 11 per chip) including shipment. If you order from a non-European Union country there might be additional taxes charged by your national customs. Five Chips is the minimum order, there's no smaller amounts available. If you need larger amounts please contact us. In the EU, you have the legal right to cancel your order (and return the sealed chips) anytime within 14 days after ordering. Estimated delivery time: Typically we ship on the day you order, max. 3 days. Your credit card will be charged on the day we ship the chips, instant payment with Paypal.